Themed party events are definitely in vogue right now. What’s more, the 1920s is the decade many party planners opt for when it comes to putting on a razzle dazzle event. So, why is it that a prohibition party always come high on the list? Well, the 1920s as a decade has so much for planners – professional or private – to get their teeth stuck into. It was the roaring twenties, after all. It’s the era of flapper girls, fun and frivolity. The decade has been popularised several times in film and TV in recent years. From Downton Abbey to The Great Gatsby and, most recently, Peaky Blinders – the 1920s have been pushed very much to the ‘front of mind’ of audiences. Of all your 1920s options, a prohibition party is perhaps the most fun. 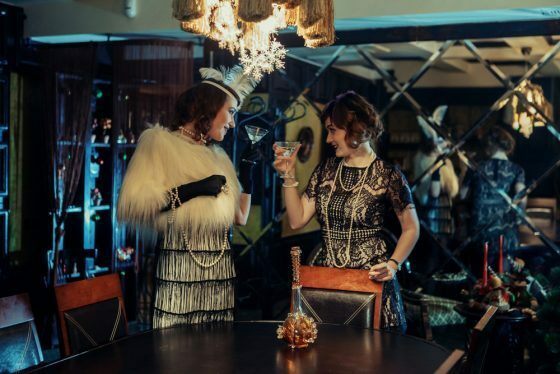 It’s the air of decadence and danger that makes the world of the speakeasy so appealing. So, how do you throw the killer prohibition party? Prohibition Party: Keep it quiet! The first rule of throwing a prohibition party is keeping it quiet. Ignore the usual channels: social media and events pages. A party in the prohibition party would not be have been publicized! Don’t shout from the rooftops. Add an air of mystery. Send out ‘old school’ paper invitations. Make your event fun and a little bit different from the outset. You don’t want your party gatecrashed by the feds and the narcs, now do you? Okay, so we’re getting a little bit carried away here, but a speakeasies in the 1920s had to be careful. They chose obscure, hidden and underground venues to avoid detection from the authorities. Emulate this a little. Keep the venue secret until the last minute. Hand out convoluted, puzzle-like directions. Add to that sense of fun! Using the front door defeats the object after your guests have had to guess and work hard to find the venue. Have you got a back door or a secret entrance guests could use instead? People love dressing up. Nothing adds to the sense of occasion more than a spot of fancy dress. A prohibition party gives your guests to really go to own. For the fellas: sharp suits, pocket watches and pinstripes. For the ladies, it’s all about the flapper dress and feathered headpiece. Anything goes – just as long as you can dance the night away in comfort and style. If there’s going to be dancing, you need music – and this is where The Jazz Spivs earn their crust! You want an authentic 192os jazz sound built for speakeasy: you’ve found it with these guys. Get in touch using our quick enquiry form or give us a call on 0800 756 5512 to get this speakeasy show on the road!